That blue artificial body lies cold here, in front of me, staring at my mortal face. Boldly daring me to put my hands around her. Waiting for me to unveil her and grip her on the waist. Or maybe just asking me gently. Her face expression unrecognizable to me. Or, is she having the blissful rest she wants. And how much does she really have left inside her? I wish I understood her better. She’s not mine. I kidnapped her. I sneaked her out when no one was looking. No! No! But, don’t call me a thief! Please! I’m not a criminal. I took her… Maybe, So I could write just as beautifully as her owner did. So I could also sprout up tears and make people smile through my words just as easily as her owner could do. But, sitting on My cozy chair now, I stare at her and question myself – what if all the wax this candle has left gets melted without lighting up a fire? She has constructed an aurora with its spirit before; lit up bonfire in reader’s eyes, tickled ribs and broke hearts. She is powerful. And there is still blood flowing inside her! I can see it. She’s mortal, but she’s not done yet. She’s alive. But henceforth, each moment she walks on the white-sand beach that I take her to, would her steps be able to leave a footprint? I have the power and yet I don’t. She dares me, but I can’t pick her up. 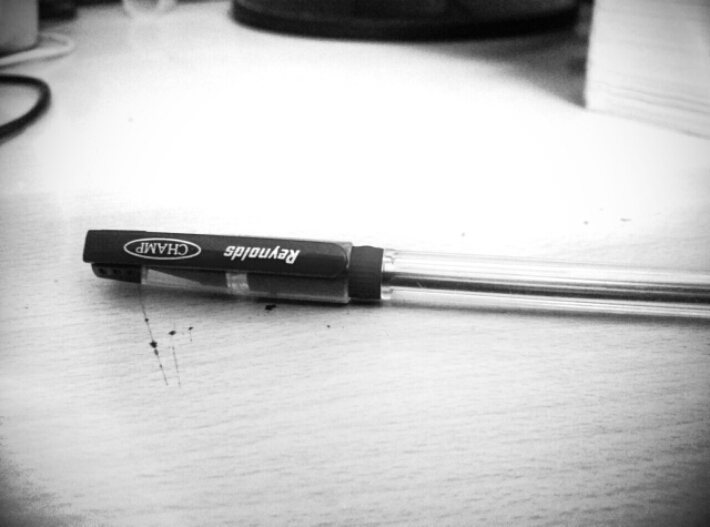 This Pen, my queen. My lady. I must just set her free.